When you are active on social media you know how important it is to take a good #selfie and for me, it has been a learning experience. Today I wanted to share some selfie tips I have learned along the way! Yes, there may be apps to “smooth”, whiten and photoshop your skin, but the best selfies are those that look realistic (vs. the ones that due to smoothing apps look like oil paintings). The better your skin looks, the less artificial smoothing you will need and the basis of a flawless complexion is a good skin care regimen. Tip 1. Follow a good daily skin care regimen, such as the Neutrogena® Oil-Free Pink Grapefruit Line that not only cleans and revitalizes your skin, but it also delivers a refreshing blast of 100% naturally derived grapefruit extract. 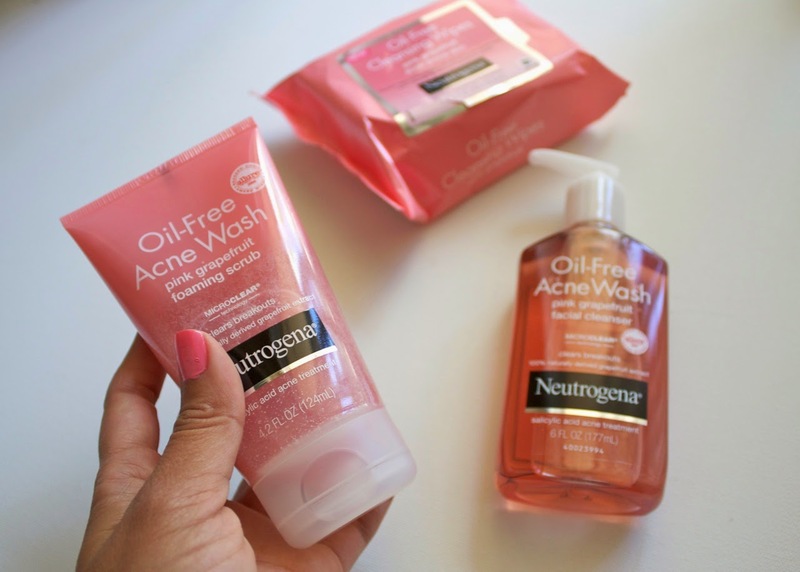 Products like the Neutrogena® Oil-Free Cleansing Wipes Pink Grapefruit for Acne-Prone Skin, Neutrogena® Oil-Free Acne Wash Pink Grapefruit Facial Cleanser, and Neutrogena® Oil-Free Acne Wash Pink Grapefruit Foaming Scrub are all gentle enough to use on a daily basis and prevent those breakouts that we don't want to show in our selfies. Products like these allow me to showcase my true selfie and my olive Latina skin! Tip 2. Find your best angle. Take selfies in different angles and identify the angle that you like best. Tip 3. Take many and choose the best. Let's be honest to every published selfie there are many "rough drafts" that didn't make it. I take about 10 before I reach THE ONE and it's mainly because the lighting, angle, complexion all have to look on point at the same time. Tip 4. Smile. I smile in most of my selfies because I feel uncomfortable when I don't and end up looking like Zoolander! I tend to 'like' other women's similing selfies because you can just feel the positive energy come through the picture. Tip 5. Be Confident. Don't be afraid to share your beautiful confident self with the world! In fact, share your selfie with me on Instagram by hashtagging it with #NeutrogenaSelfie! Enter the link to your instagram picture in the rafflecopter below for a chance to win.... (drum roll please)... one of three individual consultations with Neutrogena experts and a 1 year-long supply of Neutrogena products valued at $1,000!!! Giveaway ends August 29, 2014! Good Luck! Check out my Instagram as I will be sharing #NeutrogenaSelfie's all week long! 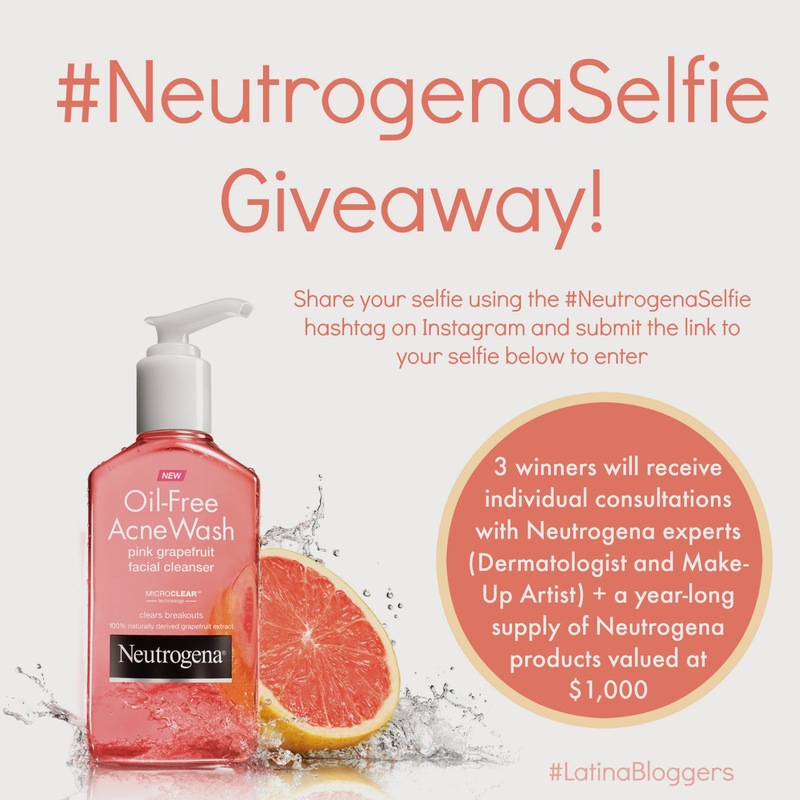 Please note that this is in collaboration with Neutrogena and Latina Bloggers Connect, this post was created and written by me for lilbitsofchic.com and express my personal views and opinions.